The City of Cape Town is accused of frustrating the mediation process the Western Cape High Court ordered to find an amicable solution to relocating over 1000 families illegally living on land in Du Noon that is owned by Transnet. 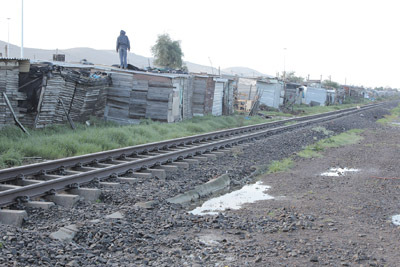 Early in June Transnet Freight Rail attorneys applied to the High Court seeking an order to evict Siyahlala informal settlement residents living alongside the railway line. After a directive from the court, a mediation team comprising of Transnet Freight Rail, the City of Cape Town and 10 Community leaders from the informal settlement was established on June 20. But in the mediation process has been frustrated by the city’s unwillingness to provide alternative land on to which the Siyahlala residents can move, said a Transnet attorney. The attorney, who asked not to be named as he was not authorised to speak directly to the press, said the City’s attitude seemed to be that “these people are on your land so deal with them”. Head of the 10 community leaders representing the residents, Andile Peter, said even though the Siyahlala residents were on Transnet land, the City should consider the filthy conditions residents suffered and their inability to receive municipal services as they stayed on privately owned land. He said the City had made it clear during the mediation process that it wanted Transnet to provide alternative land for the residents to move to. The impasse led the community leaders to storm out of the mediation meeting on Tuesday after the City refused to agree to any suggested available land options, said Peter. “There is no point of continuing with the mediation process if the City is not willing to come to the party,” he said. “The court application will be two fold: apply for an eviction order and apply to the court to force the city to provide alternative land,” the attorney said. He said in some cases the resident’s shacks were built two-metres away from the railway line and the application to evict them was for their own safety.